Residents of the City of Worcester may petition the City Council to restrict parking on a residential street. The Council, through its Traffic & Parking Subcommittee, may approve an ordinance to restrict parking to "Residents Only" for one or both sides of a street and during certain hours or days. Are the City of Worcester parking lots and garages near downtown and other areas of interest? Yes. There are city-owned parking garages and parking lots in the downtown area and other parts of the City. Are there time limits for parking at a meter? Yes, there are limits for parking at meters. Each meter has a time allotment stamped on it. If you continue to park at the meter after a specific amount of time (e.g., 15 minutes, 30 minutes, etc.) you may receive an over-time ticket. You must move your vehicle to another location when your time has expired. Can I go back and "feed" the meter after the posted limit is up to get additional time? No. The posted limits of 1 hour and 2 hours are strictly enforced. The purpose of creating a time limit is to allow other motorists to find parking so they can patronize local businesses. If you need longer-term parking, there are 10 parking lots and 5 parking garages located throughout the City that charge affordable rates. Please see our Municipal Garages and Parking Lots page for more information. How do pay stations work? Enter the space number where your vehicle is parked via the numeric keypad, then press "OK."
Scroll through the hourly choices and make your selection. Pay for parking using credit card, bills and/or coins. Retrieve your receipt/change in the bottom ticket chute (lift the door). NOTE: Hit the red "Cancel" button at any time to return to the main screen. You do NOT need to display the receipt on your dash/window. I appealed a parking ticket in writing and was denied. How do I request a hearing? If you believe you have paid a ticket that you are being billed for, contact the Parking Administration Office at 508-799-8656. I just moved to a street that has signs stating "Resident Parking Permit Only." Why did I get a ticket? 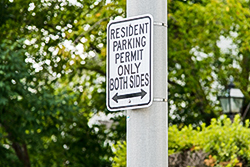 Resident Parking by Permit Only is a City of Worcester Ordinance, which means you must have a permit issued by the City of Worcester to park on that street even if you live on that street. If you don't have a permit, then you may receive a parking ticket. To obtain a permit, you must fill out an application and send it along with applicable fees to: Parking Administration Office. If you have questions regarding the Residential Parking Program, please call 508-799-8656, between the hours of 8 a.m. - 5 p.m., Monday through Friday. I parked at a meter and received a parking ticket for an EXPIRED meter but I think the meter is broken. What should I do? Report non-functioning meters to the DPW&P at 508-929-1300 within 72 hours of receiving a ticket between the hours of 7:30 a.m. - 5 p.m. Monday - Friday. Once the meter is confirmed defective, mail the ticket to the Parking Administration with the words "Non-Functioning Meter" on the front of the ticket. Include your name and address with the ticket in order to receive a confirmation letter for the dismissed ticket. NOTE: An overtime meter violation may be issued if your vehicle is parked in a metered space over the allotted meter time, even if the meter is defective. No. A handicap placard allows you to park only in a handicap designated space and at any metered space without paying the meter. To obtain a handicap placard you must apply at any Massachusetts Registry of Motor Vehicles. For more information, contact them at 1-800-858-3926. What happens if I lose my garage ticket? You will be assessed a $20 parking fee. What type of payment is accepted at parking meters? Most single-space parking meters accept all coins and credit cards. All paystations accept all coins, bills and credit cards. When are parking meters and parking regulations enforced? Parking meters are enforced from 8 a.m., to 8 p.m. Monday - Saturday. Parking on Sunday and holidays are free of charge. Why did I get a ticket while unloading my vehicle in a "Commercial Loading Zone?" Commercial Loading Zones are for commercial registered vehicles only. Only vehicles with a commercial registration may park in this zone and are given a 30 minute time limit for loading/unloading.